Una Floor Plan Open Floor. 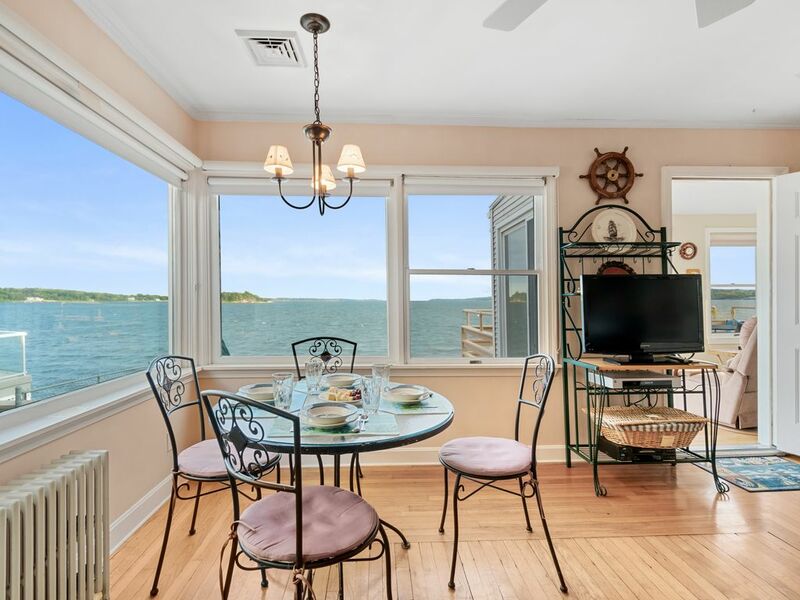 Godere di una vista spettacolare di Narragansett Bay da ogni posto in casa, e anche dal lavandino della cucina! Completamente attrezzata 2 camere da letto, 2 bagno di casa con aria centrale, pavimenti in legno, e bel sole portico grande per il pisolino o semplicemente guardare le barche a vela che passano. Se si cura di esplorare la zona, è un disco facile da Newport, Providence, Tiverton, Little Compton, Bristol, Warren e Fall River. Boston e Cape Cod sono solo un'ora di macchina. Colt State Park, con le sue belle piste ciclabili lungo la baia è a soli 10 minuti di distanza. Prendete un disco lungo la Tiverton Shoreline fuori a Little Compton e fermarsi a Gray Ice Cream sulla strada di casa dal Winery Tour in Sakonnet Vineyards. My family spent the week here to celebrate my daughter’s birthday and Thanksgiving. The view and the amenities provided made the experience wonderful. The owners were very accommodating and we couldn’t have asked for anything more. A Peaceful and enjoyable sanctuary. We will be back! I recently stayed in David's home with my husband while spending time helping my mom get into assisted living in nearby Swansea. A stressful time, it was a blessing to wake every morning to the lapping of the bay always a new and different site to behold with the ever changing sea and weather along with the sound of gulls. It was a clean, cozy, warm house with everything we needed. Plenty of good lighting, we are readers and I always look for houses with plenty of lamps near comfy chairs. The views are spectacular and the scent of the salt water brought me back to my childhood in the area. I would like to return in the summer but this was perfect even for October. Lots of outside seating and the sun room was my second home. I started each day there with my cup of coffee. We appreciated the well organized manual letting us know all the most important info. We found a great local restaurant that we ate several meals at called Reidy's Family Restaurant on East Main Rd. only 5 minutes away. Prices were better than great and the locals were very friendly. We did enjoy a trip to Newport and the Breakers on the 12 mile Drive. David and his daughter were very easy to reach as well as helpful. We had everything we needed. I want to thank them both for turning a very stressful time with mom into a sanctuary to come home to every evening. Thank You so much for sharing your home with us. Loved this sweet little house! What a cute cottage in Portsmouth. Beautiful views from the living area and the sunroom. Owners so easy (and nice) to work with. House was fully stocked with most of our needs. When we first walked into the home the first view was the beautiful bay. Excellent! The home was everything we had hoped for with windows looking out at the water, the sun room for a rainy day and the open deck. The kitchen was fully stocked and made it easy for us to cook meals. My husband had a miss hap with the shower curtain and when we called it was fixed by the time we came back. While we were there the owner brought new Adirondack chairs for the area below the deck and he was very friendly and gracious. We would definitely return for another vacation as the location was perfect- close to Providence and Newport- but far enough away for less traffic and a quiet environment. Overall the rental was terrific and made our vacation very enjoyable! Beautiful view. Peaceful. Very clean. Owners were very nice. Absolutely The Best Vacation Rental! This is our second time renting this house. We absolutely love being there. It truly is a million dollar view. It's so relaxing and quiet. The owners are great! They have thought of every thing you might need but forgot to bring. Looking forward to coming back next year! Walk To Flo Clamshack Basta mezzo miglio lungo la strada per provare i migliori Fried Clams, pesce, E clamcakes Anywhere. Ristoranti a pochi passi Include Scampi di 15 Point Road, e Graziano di. Just A drive di 15 minuti al Newport spiagge, cantine, Mansions, e lo shopping. 25 minuti alla Provvidenza e Famous Waterfire. Un'ora da Boston ea un'ora da Cape Cod.